River the Cat. I’m pretty sure my youngest feline thinks he was born from my uterus. We took him in from a family member who took him from a poor living condition – a one bedroom apartment with several other cats and a handful of dogs. The first time I saw him, I told my Aunt, ‘He looks like he’s going to die, you shouldn’t have taken him home’. And it was true. The baby was a kitten, but because his health was so poor, he was emaciated and missing most of his teeth that had fallen out due to poor nutrition. He had mites so bad he couldn’t hear well through the black gunk in his ears and he had barely enough energy to breath through his horrible upper respiratory illness that he couldn’t play. Determined to not give up on him, I relieved him from my Aunt’s custody and took him home, but told my oldest child not to name him. I didn’t think he would make it through the weekend. That was two years ago. The Vet shook his head at me the first time he examined the cat, wondering why I wouldn’t just put him down and out of his misery – but I refused. There was no way to tell exactly how old he was, and the Vet was mostly sure he was a female. So we took him home, bathed him, and set him up in his own little safe house inside the old dog training crate, complete with a cat condo bed, little box and water/food bowl. During the day, we let the cat out to roam around our bedroom and at night he was put inside the crate to keep his ear flapping mess and snotty nose from ending up all over the room. We did this for one month. 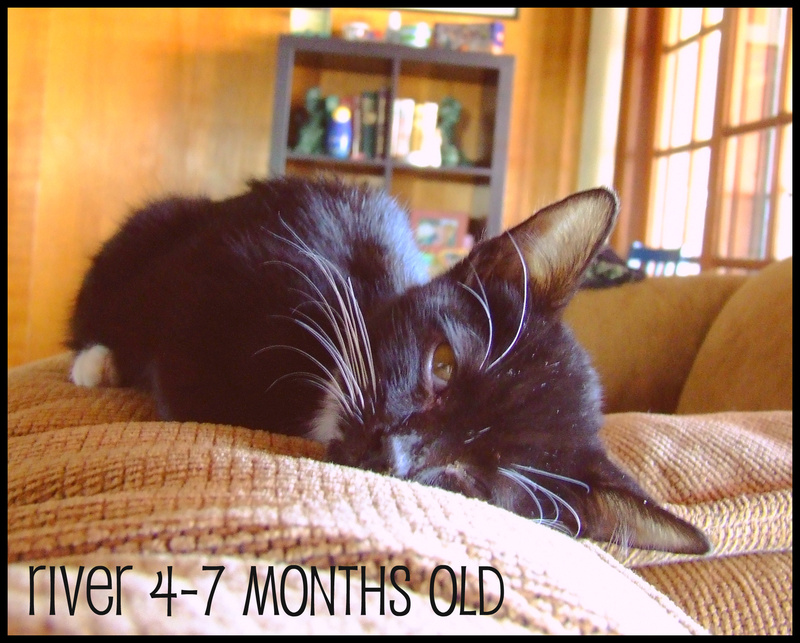 Slowly, as his cold improved, and his ear mites were taken care of…he started to play. First with a string here, a crunchy toy there and then our feet or hands under the blanket. Not long after this (we had already named him River, after one of our favorite Firefly characters) it was discovered that River was in fact…a boy. Several weeks of sniffing under the door and we finally felt confident our older g’pa cat, P.J. and our mixed breed, 2 year old dog Zoey wouldn’t attack him. He is now best friends with both of them, tho the older cat will NEVER get friendly with the dog. 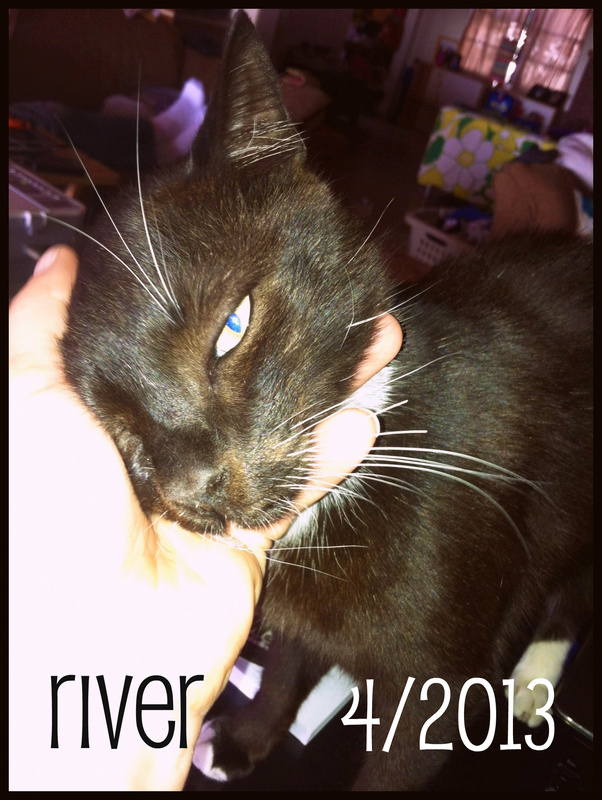 Last year, River got sick. It was Christmas day and I noticed he slept through all the crazy present opening and running around children and when we popped open the canned food – he barely lifted his head up off his favorite sleeping chair, which is MY favorite lounging chair, of course. The next day his condition worsened. He had diarrhea, and little interest in food or water. Two days after Christmas he stopped moving and we rushed him to the Vet. I cried the entire way there, knowing something was horribly wrong with him, and not knowing what it was. He was warm – really warm and non-responsive the entire twenty-minute drive. The nurses rushed to his aid when we arrived, lifted his limp and fevered body from my arms and took him away from me. His temperature was well over 102* but that night it spiked to 105*. His severe dehydration was shutting down his kidneys. After spending the night in the ER, with tests done and x-rays taken, the Doctors were unable to tell me exactly what happened. It would have cost thousands of dollars more to find out exactly what went wrong. He didn’t have an obstruction, as he started using the toilet before the Vet’s sent him back with us. It was a mystery. But one thing was clear – he very nearly died. 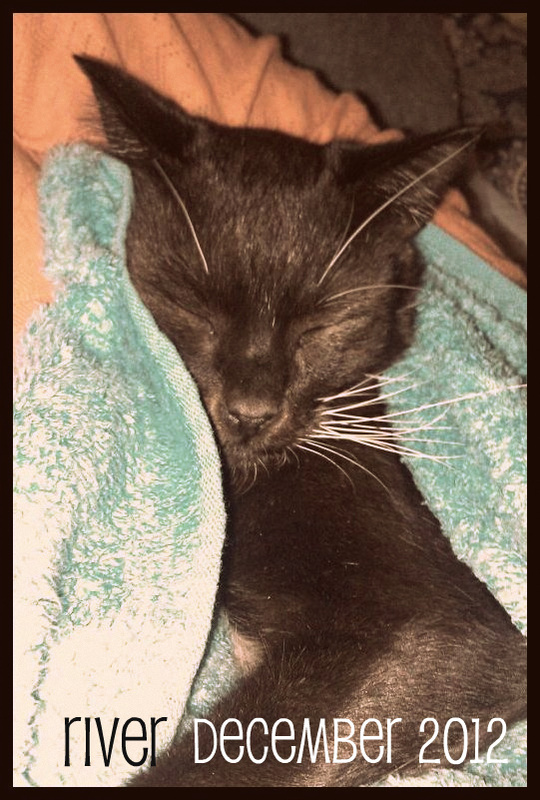 For one month we administered IV fluids to him at home. Two weeks might have been enough, but I was afraid of him becoming dehydrated again and his fever returning. When he started fighting off his doses of IV fluids and bit me during one of the last treatments, I knew River was a fighter – he wasn’t ready to leave us. Those few weeks spent in our room, in isolation, for the second time in our home, truly bonded River to me. He has always been a Momma’s Boy, but now that’s amplified. I believe he thinks he’s my human child. He greets me with kisses on my face, and still attempts to climb under the covers and snuggle with me – which is where I had him sleep this past New Year. If he was going to pass in the middle of the night, I didn’t want him to be alone. River is a cat. He is not a human child. But he is still my baby. He is more of a mellow kitty now, but he has recovered. He somehow survived a rough start to life and a scary illness that should have claimed him – and yet he is still here…scratching up my furniture, playing nicely with my children, pawing at my arms when I’m typing on my computer, cleaning his feline brother and canine sister’s hair, coming when called by name, and kissing my nose as needed. He likes to lay next to the laptop as I write, perhaps listening to the keys clink, feeling the warm air from the machine, perhaps wondering what is so important that my hands spend all that time in one place, when they could be rubbing his ears or scratching the top of his head, or balancing him on one shoulder. Either way, he knows he is loved here, and I know he is grateful. Sometimes I catch River staring at me. Not in a ‘feed-me-now-human-or-I-will-revolt-and-piss-on-your-bed’ type of way. In a way that makes me wish I could read his thoughts. He’s one of my best friends and when he stares at me with his peaceful, green eyes, I like to think he’s saying the say thing to me. Sniffle. As a cat lover and rescuer I found this so touching. Yes they do love those who save them and provide water and feedings every two hours when they are knocking on deaths door. They never forget it somewhere in the deep recesses of their feline minds. I am well familiar with the look you mention, one of unblinking fixation that speaks of their connection to us. A bond that can’t be broken. Thanks for a great short read. Had tears in my eyes, as I read of your beautiful cat River and your devotion to each other. You are not only his Mother, you are his Angel. So glad River is better now and you are an amazing being for rescuing and taking such care of him. He looks pretty amazing too and is absolutely a survivor and a fighter- it goes to show that you can be related even if you are not the same species. All my furbabies are my children, cats and dogs. Much Love to you both.